Though voting rights are fundamental to American democracy, felon disfranchisement, voter identification laws, and hard-to-access polling locations with limited hours are a few of the ways voter turnout is suppressed. 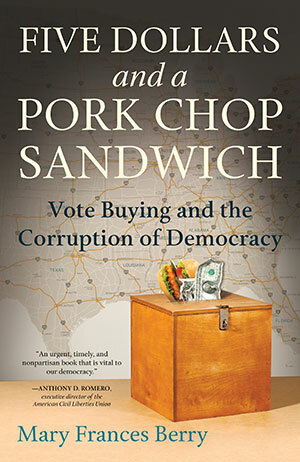 These methods of voter suppression are pernicious, but in Five Dollars and a Pork Chop Sandwich, Dr. Mary Frances Berry focuses on forms of corruption including vote buying, vote hauling, the abuse of absentee ballots, and other illegal practices by candidates and their middlemen, often in collusion with local election officials. Vote buying—whether it’s for a few dollars, a beer, or a pack of cigarettes—is offered to individual citizens in order to ensure votes for a particular candidate, and Dr. Berry notes it occurs across party lines, with Republicans, Democrats, and independents all participating. Dr. Berry shares the compelling story of Greg Malveaux, former director of Louisiana’s Vote Fraud Division, and how this “everyman” tried to clean up elections in a state notorious for corruption. Malveaux discovered virtually every type of electoral fraud during his tenure and saw firsthand how abuses occurred in local communities—from city councils to coroners’ offices. In spite of Sisyphean persistence, he found it virtually impossible to challenge the status quo. Dr. Berry reveals how this type of electoral abuse is rampant across the country and includes myriad examples from other states, including Illinois, Texas, Florida, Kentucky, and Mississippi. Voter manipulation is rarely exposed and may be perceived as relatively innocuous, however; Dr. Berry observes that in addition to undermining basic democracy, it also leads to a profound lack of accountability and a total disconnect between politicians and their constituents, and that those in poor and minority communities are the most vulnerable. While reforming campaign finance laws are undeniably important to our democracy, being attuned to issues of structural powerlessness and poverty, and to the cycles that perpetuate them, is no less crucial. In Five Dollars and a Pork Chop Sandwich, Dr. Berry shares specific successful voting strategies that other countries have adopted and urges creativity in rewarding people for voting. She also underscores the continued importance of grassroots education, so that citizens see voting as desirable and empowering—as a tool to help create the kind of environment they deserve.